The system-on-chip in mobile devices play a really important role in image processing. There’s a variety of imaging sensors for mobile platforms, but device makers can’t simply slap together any sensor they want with any SoC of their choice. The Image Signal Processor (ISP) in the SoC is responsible for many things like demosaicing, autofocus, noise reduction, HDR, preview framerates, and resolution, and more. If you want to know exactly what kind of image sensors can be paired with a particular SoC, you’ll have to ask the chipset vendor for that information. That information is usually accessible on the vendor’s website, but there’s no guarantee that the information will be comprehensive. Fortunately, one SoC vendor, Qualcomm, recently took the time to update nearly all of their Snapdragon product pages to show more camera specifications. The product pages of the Snapdragon platforms were updated in early February. We checked the pages for mobile platforms like the Qualcomm Snapdragon 845, Snapdragon 710, Snapdragon 675, Snapdragon 670, and Snapdragon 660 and noted the updated camera specification sections. We took screenshots of the before and after of each page, using the most recent archives we could find. Before the product page update, Qualcomm generalized the maximum capabilities of the photo and video shooters that could be paired with devices on the Snapdragon mobile platforms. Now, the pages disclose more information on the framerates, megapixel, and resolution limitations, as well as codec support and other specifics. Multi-Frame Noise Reduction (MFNR) and Zero Shutter Lag (ZSL) are probably the most noticeable. MFNR is the technique behind cameras shooting a number of photos and then stacking them together, eliminating noise as much as possible. As for ZSL, this refers to keeping a full buffer of frames in memory when you open the camera application. After you press the ‘shoot’ button, one frame is taken from the buffer. This helps eliminate lag after shooting a photo. ZSL usually operates at 30fps sensor output streams. The new specifications also separate the capabilities of single and dual camera systems more clearly. 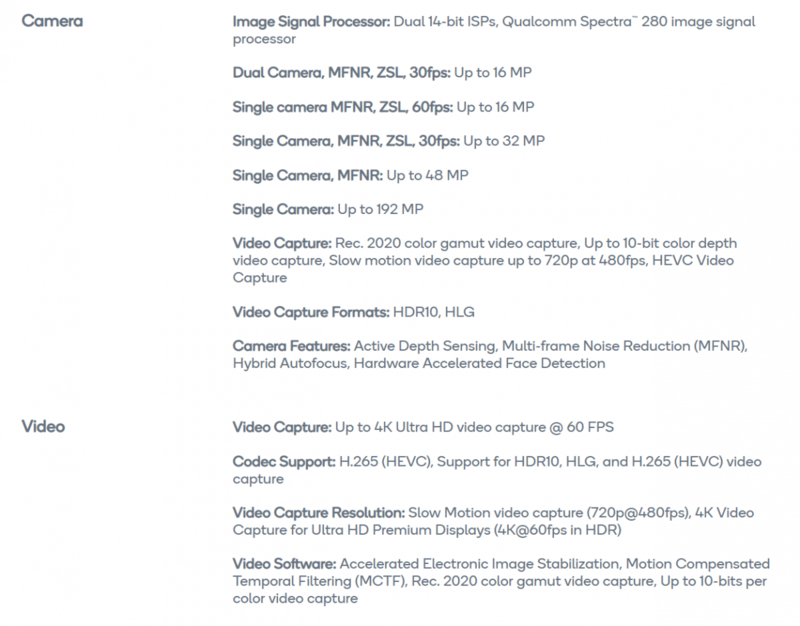 You’ll also see slow-motion recording limits and other features like Hybrid Autofocus on SoCs that support it. If you browse Qualcomm’s website, you will find more mobile platforms with updated specifications. These details will help sate the curiosity of some users as well as provide useful information to Google Camera port developers whose work depends on those details. The updated product page should also clear up how the Redmi Note 7 manages to have a 48MP camera sensor despite being paired with the Qualcomm Snapdragon 660. Special thanks to XDA Senior Member j1505243 for tipping and helping us.